Recent TV series about beach living are some of the most unreal reality shows. Houses washed away by the tidal surge during Hurricane Sandy are seen among several beach homes still standing in Seaside Heights, New Jersey, on Oct. 31, 2012. The Canadian couple on my television screen tours a small home on the north shore of the Dominican Republic. The couple, on HGTV’s Beachfront Bargain Hunt, are hoping to buy a vacation home for $300,000 or less—something in a secure neighborhood and with an ocean view. This home looks ideal, with a modern kitchen and infinity pool, the back gate just feet from the ocean. What’s never mentioned are the piles of sandbags sitting between the back fence and the high tide line. Does the house flood during storms? During exceptionally high tides? Is the ocean eating away at the land? Home and garden shows sells dreams, not reality. According to them, anyone can have that perfect kitchen with granite countertops, an open-plan first floor, a master bathroom bigger than most New York City apartments—or a home just steps from the ocean. The first three may empty your bank account, but the fourth is truly dangerous. Sea level is on the rise. What’s oceanfront this year could soon be sitting in the water. The beach is one of the most reckless places to invest in property. Despite this, recent home shows have capitalized on people’s fantasies of beach living and encouraged them to buy waterside. They follow the formula of the home-buying genre, in which a couple is shown three or four properties and the drama lies in which one they decide to purchase. The difference is only in location—beach towns in the United States, Caribbean, or sometimes farther afield. Beachfront Bargain Hunt and Buying the Beach are on TV now, and a similar show, Island Hunters, aired over the winter. Like a lot of reality TV, these shows aren’t that realistic. (The archetype of these home-buying shows, House Hunters, certainly isn’t.) And avoiding reality is perilous when it comes to the sea. Buying a home on the ocean has always been something of a gamble. Hurricanes have wiped whole towns off the map. Beaches and barrier islands have never been permanent structures; instead, they wax and wane and move over time. Measures to fix the land in place, such as seawalls and jetties, may protect a home or beach for a bit, but usually at the cost of someone else’s property. 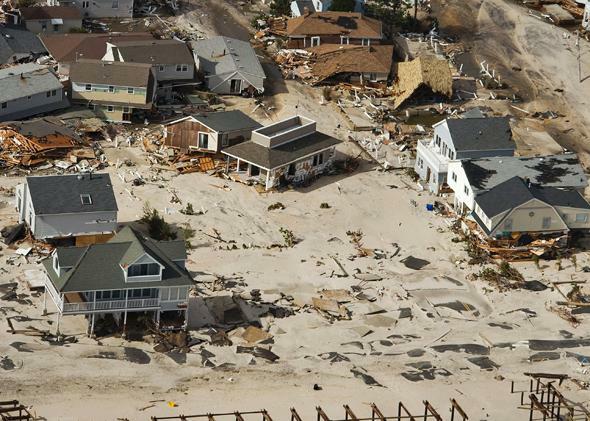 Buying the Beach actually does a decent job of mentioning some of the dangers of coastal living, such as hurricanes, and how to protect waterfront property with features such as sand dunes or stilts. One episode even highlights the moving of the Cape Hatteras lighthouse in response to beach erosion. Incorporating the fact that sea level is rising wouldn’t be out of place. But discussing sea-level rise means mentioning climate change. Climate change is altering sea level in a couple of ways. As the oceans soak up heat, the water expands. And when glaciers and ice sheets melt, that water drains into the sea. Sea levels rose mere inches in the 20th century, but scientists estimate that oceans could rise 2 to 7 feet by 2100. Even 1 foot—possible in some places within the next few decades, or less than the length of a 30-year mortgage—will eat away at beaches and destroy homes. Nuisance flooding has already increased significantly on all U.S. coasts, with no hurricanes or other storms required, the National Oceanic and Atmospheric Administration reported in July. Just play a bit with Climate Central’s Surging Seas sea-level manipulation map and it’s easy to see why coastal areas might be risky places to invest in. Even a tiny increase puts swaths of beach and waterside land at risk of being drowned. How easily he dismisses the potential loss of everything he owns. He seems to think the Federal Emergency Management Agency will just send him a check the day after a disaster to cover everything he lost. After every storm, homeowners quickly learn that this is not the case and that insurance may cover only a fraction of their losses. That’s aside from the question of whether taxpayers should be subsidizing the rebuilding of homes that have a high chance of being damaged again and again. What’s most disturbing about these shows is that they are aimed at people who are least prepared for the financial consequences of losing a home or investment property. The buyers usually aren’t wealthy; they’re just regular people who’ve been diligently saving for their dream. “We’ve been working for several years, just saving up every penny we can, that way we can afford to buy something on the beach,” says Matt, a young buyer from Colorado, on an episode of Beachfront Bargain Hunt. Even if their properties don’t end up in the ocean, homeowners may lose money on their investments when enough other people finally begin to comprehend rising sea levels. That could happen within a decade or two, according to some estimates, quickly undermining coastal property values. Of course, telling people about reality doesn’t ensure they will make good decisions. On Beachfront Bargain Hunt, a woman from Annapolis, Maryland, considers properties in Kitty Hawk, on the Outer Banks of North Carolina. Her real estate agent tells her that one property that has no dune between the back door and the ocean is a “nonconforming home.” That means that if storm damage amounted to more than 50 percent of the house’s value, she would not be able to rebuild. “So I could spend $300,000 on a house and not be able to rebuild and have nothing? … That’s very scary.” Yes, it is. When it came to making a final decision, “I’m willing to take the risk with it,” the buyer said. “It was everything I wanted. It was really important to have a house on the beach, toes in the sand.” For now, at least, the house still stands. I wasn’t surprised by the decision. People come to the beach on vacation, in lovely weather. They just don’t realize the extent of the bad storms, said Frank Jennings of the North Carolina Division of Coastal Management earlier this year when I was visiting the Outer Banks on a reporting trip with the Institute for Journalism and Natural Resources. A nor’easter was parked just offshore, and one night, 50-mile-per-hour winds scoured my face with sand. In the past few decades, McMansions have replaced salt-box homes that could have been easily picked up and moved away from the water, Jennings noted. In the past, people “built what you thought you could lose.” That’s not bad advice. Even with climate change, the beach will still be a great vacation destination. The sun and sand will still be there. Kids will still play in the waves and make sand castles. And nothing will stand between you and a great tan (except a healthy respect for skin cancer). But if you want to ensure you have a stress-free time—maybe you should rent.